Although fashion trend is easy to change, it has its popular period. But if you don’t want an outfit clash, you’d better spend more efforts styling your clothes. Today I am going to introduce you some basic women tops, with which you can easily style beautiful autumn and winter looks. Round neck sweater seems so ordinary that has nothing special to talk about, but it plays an important role when it comes to how to style and create stylish autumn and winter looks. In cool days, you can just wear a sweater coupled with fashion skirt, and that would be chic enough. When days are getting colder and colder, it is very recommended to style it with women blouse and trench coat. This kind of look is not hard to see on streets, but you can choose items with special design or to add more chic elements to distinguish you from others. If you are hesitate about what to wear inside coats, then a tight turtle neck sweater can never be wrong choice. Turtle neck sweater and trench coat are the best pair in winter. You can pick one turtleneck sweater with almost all of your trench coats and they will match perfectly. If you want to try something new, maybe you should put on shirts or hoodies outside of sweater, and that is quite popular among fashion lovers. Listing the most popular fashion items in recent years, hoodies must be one of them. Basic hoodies are so versatile that they can go with almost everything, such as denim jacket, leather jacket, trench coat, and even blazer. 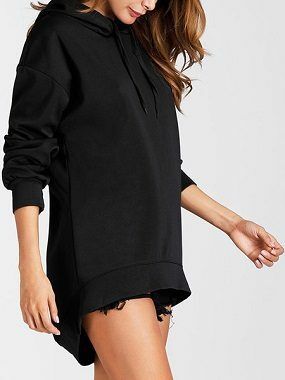 Compared to sweaters, hoodies are tend to be more casual and street. Therefore, when wearing a vintage or formal coat, you can choose bright colored hoodies to break the balance and create a good color contrast.